Zurich loves a good drinking den, especially one that transforms a formerly seedy environment in the Kreis 4 red-light district (see Longstreet for another example). Hotel Bar derives its name from its location, previously a hotel that charged by the hour. Hotel Bar opens onto Schöneggplatz, and while it’s not exactly hidden away, there is no large sign to signal that you have arrived. 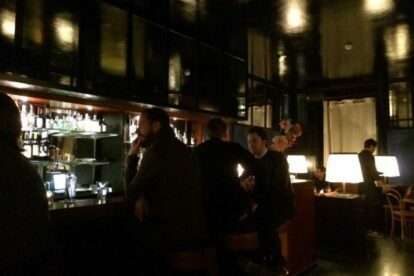 The setting is cosy, you can usually find a seat, and the friendly bar staff will look after you throughout your stay while mixing great cocktails. The music is pleasant – think ’60s soul classics – and low enough for you to be able to have a conversation. So where’s the intrigue? Apart from the former seediness and dim lights there’s the feeling that you have stumbled upon a well-kept secret. Hotel Bar has variously been described as a pop-up bar, but they are actually determined to stay – and their great success proves that their guests are very pleased about this.